In Falling Snow is an intergenerational story of love, family, and the struggle between dreams and reality. Alternating between WWI and the late 1970s, the novel traces the lives of two women as they balance work in the medical profession with societal obligations. Iris has travelled from Australia to war-ravaged France to bring her underage brother, Tom, back home. She is inadvertently absorbed into the creation of a field hospital by the commanding English surgeon Frances Ivens, and takes up the dual roles of nurse and assistant. The hospital, Royaumont, was formerly an abbey, and within its walls, Iris transitions into strong young woman. Royaumont’s all women staff transform the abbey into an efficient and respected hospital, while fighting their own battle against a world unwilling to see women doctors. Here, Iris befriends another bright but troubled young woman, Violet, and together they face the challenges of love and loss against the backdrop of chaos that was WWI. Of course, in this time, no life is untouched by tragedy, and what befalls Iris and her family has ramifications for decades to come. Intertwined with this story is the narrative of Grace, Iris’s granddaughter. Grace is an obstetrics surgeon, working in Australia in 1978. She is also a mother of three children, and a large part of her story concerns how she negotiates the demands of her career, with her family life. Iris’s health is fading, and through her story, Grace learns more about herself, and the grandmother she had long underestimated. 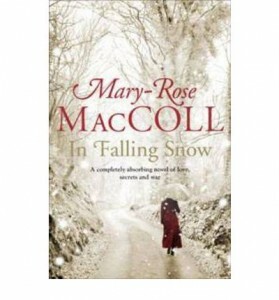 Mary-Rose MacColl spent ten years researching and writing In Falling Snow, and the detail of the novel’s WWI setting is testament to this effort. It is an ambitious novel, incorporating such a vast array of characters and settings. Although slow starting, In Falling Snow is an engaging read. MacColl uses astounding imagery, particularly in the French scenes. Character development is weaker, particularly in the 1978 chapters told from Iris’s perspective. Iris’s natural concern with death (we’re assured it is imminent) is delivered without subtlety, which is a shame. Grace’s storyline, though not the main plot, was the most engaging, and could have easily been expanded to a novel on its own. MacColl details the struggle of women to find acceptance in the medical community, even past the rush of second-wave feminism. However, the plots are given parallel, and thus MacColl makes an effort to tie everything together in the closing chapters. This is largely successful, though again, a “less is more” approach could have made final revelations more convincing. While entertaining, In Falling Snow is not a particularly inspiring book for young women. It attempts to celebrate the quiet determination and success of the women who were pioneers, but the endless guilt they are subjected to undermines this goal. Iris is established as a woman with great promise, and is faced with a career in medicine, but when she turns her back on this to raise a child, she finds happiness. Conversely, while Grace maintains a family and a career, her guilt is overwhelming. She is shown as distant from her husband and children, and hyperconscious of the fact she is not fulfilling her maternal duties. While the role of mothers is doubtlessly undervalued in our society, the novel could have made more interesting choices in terms of championing women who break free from convention. “After all, we’re women” is the battle cry of Royaumont, but the vast possibility of female capability remains largely unexplored. In Falling Snow covers some pretty heavy subject matter, but MacColl’s well-crafted language make the novel quite easy reading. The dilemmas faced by the women in both eras are engaging, and the characters are above all shown as human, imperfect but sincere. If you’re looking for a holiday read that isn’t too fluffy, In Falling Snow is the book for you. This entry was posted in Arts, Books and tagged allen and unwin, book review, books, history, in falling snow, literature, Mary-Rose MacColl, Review, war. Bookmark the permalink.